Successfully Added Galactus - Cellphone Watch With Video Camera + Media Player to your Shopping Cart. The Galactus is part rugged watch, part DV camera, part digital audio and video player, and 100% cellphone! First and foremost, this unit is a high quality quad band GSM (850MHz, 900MHz, 1800MHz, 1900MHz) unlocked mobile phone that fits on your wrist. Stick in a SIM card and use it as a highly convenient mobile phone. This phone features a high quality touchscreen LCD display and virtual keypad for quick dialing and texting while on the go. It also comes with a great Bluetooth headset for further versatility. Not only is the Galactus a wrist mount cellular phone, it also contains a digital still and video camera, making this unit a real wrist-top command center! The camera lens is conveniently situated right of the clock number 3 position so you can take photos and videos conspicuously or inconspicuously - yes, it's a cell phone / watch all in one! Connect the watch to your computer and download your days photos and videos so you can relive all the days events. Nothing could be easier. No longer will you have to carry around a mp3/mp4 player or iPod. 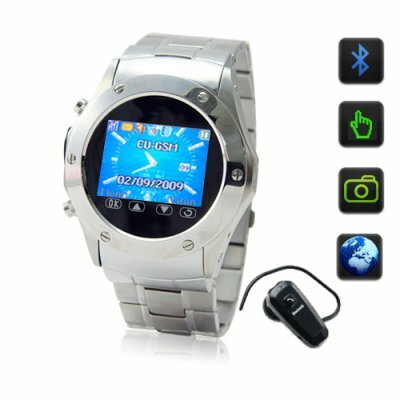 This incredible mobile phone watch plays the most popular audio video files, displays photos and is even an ebook reader. Did we mention it comes with FM radio too? While you're at it, ditch the personal information manager too. These days PDA's come with too many features, more than the average person needs. In contrast, this baby comes with a Calendar, To Do List, and Alarm to keep things simple, yet organized. Don't delay, order one of the amazing Galactus cellphone watches right away and once you realize how great the quality is, order some as stock in your online store or list as a dropship item to maximize your cash flow. Brought to you by the online leader in direct from China wholesale electronics - Chinavasion. NOTE: This product is compatible with the worldwide standard GSM frequencies of 850MHz, 900MHz, 1800MHz and 1900MHz. Please check with your local provider if you are unsure of your local band requirement. Contact Manager can store 500 contacts. SIM cards can usually store an extra 250 contacts. No longer do you need to keep your phone in your trouser pockets where the screen gets scratched up by your keys. No longer will you need to hold onto the phone and not have the use of both hands. This phone is both practical and perfect! Before your first use, charge the battery for 12 hours. Thereafter 2-3 hours is great. Can I change the ringtone on this cellphone? This phone comes with 25 default ring tones. Or you can easily use your own music track as a ring tone. Better yet, use the sound recorder function to record your own voice and use that as your ringtone! Is the CVSL-M49 water proof? No, the mobile phone wrist watch comes with on board speakers, MIC, micro SD card, and qwerty keyboard, that are not water proof.